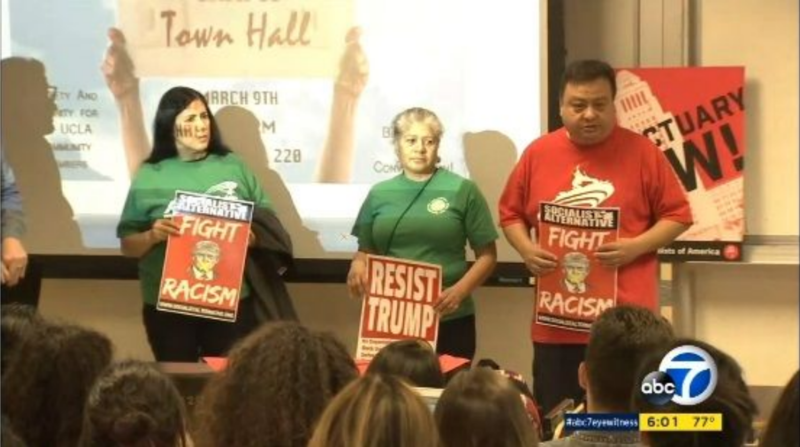 On March 9th, over 200 members of the UCLA community convened in a packed lecture hall to build a fightback against Trump’s planned attacks on immigrants. Socialist Students at UCLA hosted the meeting where the Student Labor Advocacy Project coalition of Muslims, undocumented immigrants, campus workers, queer students, and UCLA activists presented their demands for a Sanctuary UCLA. It is estimated that UCLA is home to over 700 undocumented students, in addition to the thousands of undocumented workers employed throughout the University of California system. The coalition is planning a follow up action @ 4pm on Monday March 12 outside Haines Hall to present their demands to UCLA Chancellor Gene Block before the end of the Winter term. Block’s recent email to the campus regarding immigration is evidence that UC bureaucrats are not immune to the pressures of student and worker mobilization. However, students cannot rely on the goodwill of administrators, and undoubtedly an escalation campaign will be necessary throughout the Spring term to force the UCLA administration to make policy concessions to the movement. The list of 15 demands was compiled by the most directly targeted community groups within the SLAP coalition, with the undocumented, Muslim, queer, POC, and union groups leading the formulation of policy proposals. Socialist Students @ UCLA fully endorses the coalition’s proposals, which demand UCLA end collaboration with Immigration authorities, protect private data, denounce Muslim registries, combat campus sexual violence, and expand resources for targeted communities. These demands grow from an intersectional approach to campus collaboration, firmly supported by two of the UC system’s most militant unions, AFSCME Local 3299 and UAW Local 2865. “We are here to build a sanctuary at UCLA and all the ten campuses. We’re not going to give up until we get it.” Jose Mendez, a union worker at UCLA for 32 years. Jose Mendez, a member of AFSCME 3299’s executive board, highlighted the union’s commitment to the undocumented community. “I always stand with the students, and the students always stand with the workers. We are a family and we here to stay! We are here to build a sanctuary at UCLA and all the ten campuses. We’re not going to give up until we get it. I’m going to go to the bargaining table in two weeks to tell [the office of the UC President] that we are not going to stop until this is done the right way.” In February the union presented a similar list of sanctuary proposals as part of their formal contract negotiation. They are likely to go on strike at the beginning of the summer when their three year contract expires. The SLAP coalition has not limited itself to campus mobilization. UCLA graduate students and socialist activists crashed Mayor Eric Garcetti’s victory party after his triumph in Tuesday’s municipal election. A handful of students slipped into the venue, disrupting the Mayor’s victory speech to demand a Sanctuary City, while hundreds picketed beyond Garcetti’s line of police. A dynamic direct action campaign led by SLAP must be combined with a campaign to build broader public support. UCLA activists should build for a general strike on May 1st in solidarity with workers, students, and oppressed people across the country!